As ever, Apple is apparently doomed. You might not think so from its most recent quarterly results, which showed the company enjoying record Q3 sales and profits, growing its cash mountain to a colossal $164.5 billion. But there's always something for analysts to pick at, and this time it was the iPad. There's no hiding from the fact sales fell. During the last quarter, Apple sold 13.3 million tablets, down from both the previous quarter (16.3 million) and also the equivalent quarter in 2013 (14.6 million). Analysts fumed and frothed, but Apple CEO Tim Cook countered that the figures were at the high end of Apple's own expectations, and were somewhat gated by inventory issues. Cook also reasoned the tablet market was still in its infancy, and had room to grow in terms of business use and innovation. The question, then, is whether there really is a problem. Even this very site quipped we could be seeing the end of an 'iFad', and most tech pundits are furiously typing away, mostly trying to figure out precisely how doomed the iPad is - and where is that iWatch anyway? If the argument is that the iPad is no longer hitting expectations, it's necessary to unpick whose expectations you're talking about. With analysts, it's clear even if Apple sold 50 million iPads, they'd be griping about something, and so they can largely be ignored. The bigger question is if the sales slump is being hit by user expectations, and whether Apple can do anything about that. For those heavily immersed in technology, there was probably the assumption the iPad would be an iPhone-style hit, whereas it's in fact transformed into a second-tier device, albeit one selling in the many millions and outperforming the Mac. The mobile market's transformed around Apple's devices, with people increasingly relying on smartphones as their primary computing device; with smartphone screens increasing in size (and the iPhone rumoured to follow suit this year), the tablet may increasingly be seen as more of a luxury, especially in a time of relative economic hardship. But there are other issues, too. Tablets clearly have a longer life than smartphones, and so many who've already bought one won't upgrade until the device is effectively useless, rather like with a PC. Tablets arguably still don't enjoy a level of ubiquity in home or business use. 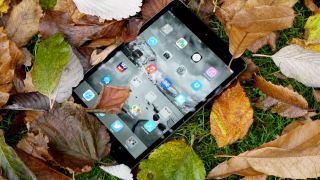 And the influx of cheap Android tablets is almost certainly hitting Apple's sales and also knocking people's experiences of tablets in general, perhaps hampering potential future iPad purchases. Maybe the biggest issue, though, is the lack of anything obviously new from the iPad in quite a while. The third-generation iPad got a Retina display, and the Air is lighter than its most recent predecessors, but iOS has stubbornly stopped short of evolving in key areas. Although it's undoubtedly found its place in certain work and educational environments and for some home use, it nonetheless also frequently frustrates those used to working on PCs and Macs, through certain common tasks taking longer and being more awkward than they really should be. The future, however, could be rosy. Most obviously, the downturn in sales could just be a blip - the result of the inventory issues Cook alluded to, or down to other market forces. Moreover, the imminent arrival of iOS 8 and the recent deal with IBM provide great potential for change and a boost in sales. The latter gives Apple significant leverage in enterprise, and the former should open up the platform significantly, making it simultaneously more powerful and usable. In a year, we'll know for sure. If iPad sales again drop for equivalent quarters, there clearly is a problem, and perhaps the iPad will at best have to settle for being whatever sits between a car and truck in Steve Jobs's vehicle-based tech analogy from 2010. But anyone claiming the iPad (or the tablet market as a whole) has already failed or is a flash in the pan is at best jumping the gun, relying on a short memory that forgets markets ebb and flow and that trends are rarely apparent by looking at one quarter's results - or even a year's.